Paul. The Orpheum Automobile Hotel was the cause for our reacquaintance a few years ago. Do you remember? You sent me off to Greg Lange at the Bellevue archives where I discovered this beautiful (and now digitally cleaned up) 1937 King County WPA survey photo. I spent considerable time walking the site and offer here the gorgeous original and my 2007 shot, taken with a Nikon Coolpix 995. The mosaic brickwork on the facade is just visible, peeking out from under the metal screens, if you're looking for it. If I recall correctly, the stone facing around the driveway openings is gone, a victim of the same remodel. I can almost imagine men in tails and women in furs, pulling up to a waiting valet attendant in bow tie and white gloves, before crossing the street for a concert at the Orpheum. Maybe one day I'll return with my 4x5 on a sunny winter Sunday for a serious attempt. The WPA photographer who took the survey photo was a real artist. David Jeffers repeat of the WPA tax photo he found at the Washington State Archive on the Bellevue Community College Campus. Jeffers you are amazing. Here is a little tidbit about the Orpheum Theater that was demolished in 1967. “It Happened at the World’ Fair” was Elvis Presley’s personal favorite among all his fine films, and he was thrilled to attend its World premiere at the opulent Orpheum Theater. 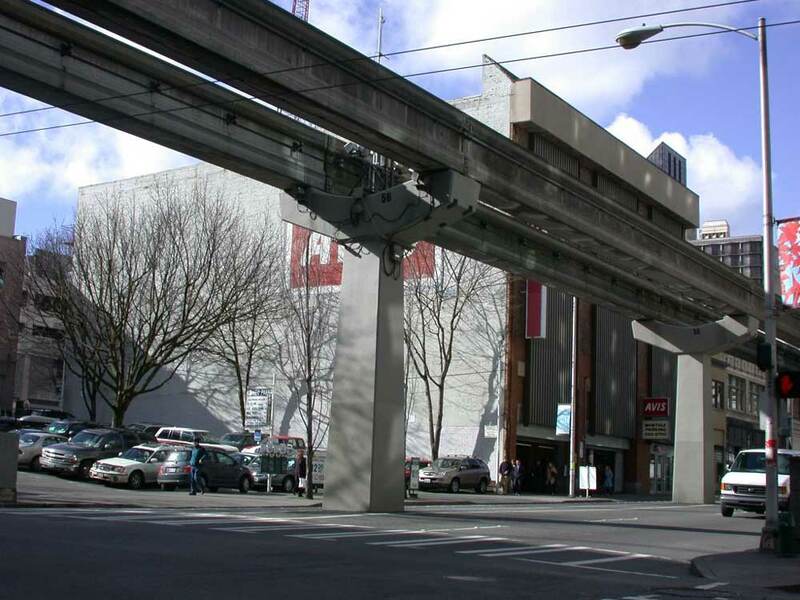 When Elvis learned, five years later, that the theatre was being destroyed to make way for a Westin Hotel, he make a special pilgrimage to Seattle to watch as the first brick was removed. When on tour, Elvis stayed in Westin Hotels whenever possible. But the next time he visited Seattle, in November 1970 to play a concert at the Coliseum, he refused to stay at the Westin because he was sentimental about the Orpheum Theater. Instead, he booked a modest room on the top floor of the Roosevelt Hotel, where a good friend of his had once honeymooned. Thanks Bill. Paul, “Great oaks from little acorns grow.” This was the start of my quest to catalog Seattle’s silent era movie theaters. You gave me the push in the right direction I needed. 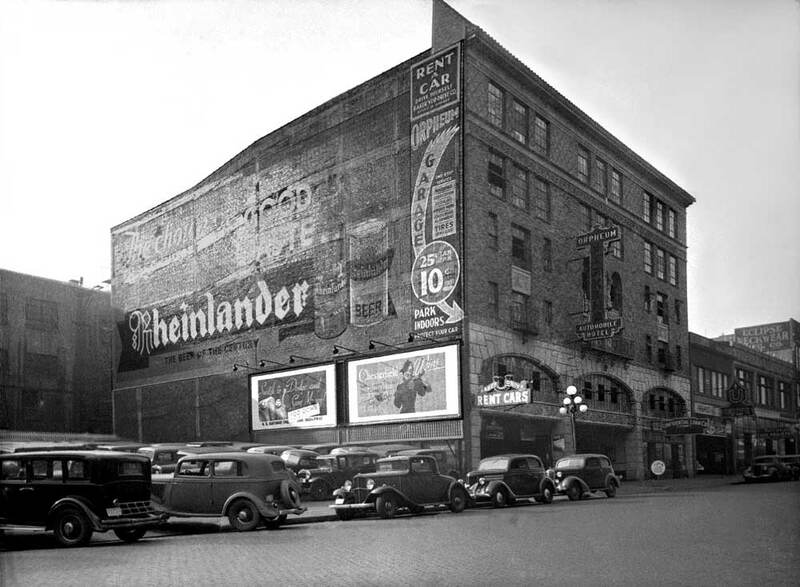 I suppose I should mention, this building is directly across 5th Avenue from the theater site and was built expressly to garage the vehicles of Orpheum patrons, hence the name. Much credit should go to the extraordinary WPA photo and its creator. This building is not a theater. It is not fancy at all, but in its original design the Orpheum Automobile Hotel was simple and elegant like a perfect baguette that complements a wonderful meal.